Schnitzel – the name may sound complicated, the recipe is not. I had Chicken Schnitzel at a local restaurant recently, and one night when I was out of dinner ideas, I decided to make it at home. If you ever wonder how to make Chicken Schnitzel, remember, it’s a simple to make chicken dish. It is just chicken breast is pounded thin, breaded and fried crisp and golden brown. Pounding chicken breasts to a uniform thickness cuts down on cooking time, so make sure the you beat the chicken evenly. 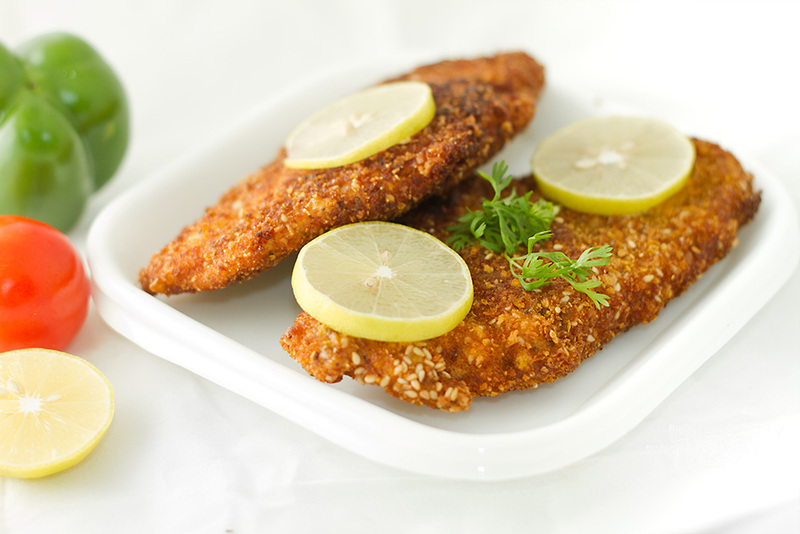 If you are into healthy recipes, you can make a healthier version of Chicken Schnitzel by frying it in an Air Fryer. The German word Schnitzel, is a diminutive of Sniz ‘slice’. A schnitzel is a boneless meat, thinned with a meat tenderizer, coated with flour, beaten eggs and bread crumbs, and then fried. A popular food in many countries, it is made from veal, mutton, chicken, beef, turkey,reindeer or pork. The English term schnitzel means in general all types of breaded, fried flat pieces of meat. Due to the similarity between schnitzel and escalope, in many of the countries listed below, people sometimes refer to schnitzels as escalope, and vice versa. A Wiener Schnitzel, the national dish of Austria, is a very thin, breaded and pan fried cutlet made from veal. It is one of the best known specialities of Viennese cuisine and is traditionally garnished with a slice of lemon and either potato salad or potatoes with parsley and butter. Beef(veal) and chicken schnitzel are both very popular dishes in Australia, particularly in pubs where they are among the most widely available meals. Chicken schnitzel (less so beef) is also sold at many take-away establishments. Schnitzel in Australia is often served in the form of the schnitzel parmigiana, which is a schnitzel topped with Italian tomato sauce, cheese, and occasionally ham. At pubs, schnitzel is typically accompanied by chips (French fries), salad and sometimes bacon. Plain and parmigiana schnitzels are sometimes respectively known by colloquial names “Schnitty” and “Parma” (or “Parmie” outside the Eastern states). Chicken schnitzels are served as fillings for sandwiches and bread rolls at sandwich bars, often with mayonnaise and lettuce. Place one cleaned chicken breasts inside a sealable plastic bag (Zip lock bag works best) and use a mallet or a rolling pin to pound the chicken till it is about 1/4th inch thick uniformly. Pound all the four chicken breasts and keep aside. Marinate the chicken breast with red chile powder, pepper powder, and salt. Keep aside for 10 minutes. Break the eggs and whip them with a bit of salt and pepper, mix a pinch of salt in the flour and another pinch in the breadcrumbs. Heat oil in a skillet till it smokes, reduce the flame to medium and fry one chicken breast at a time till they are golden and crispy, and remove on an absorbent kitchen towel. Each piece does not take more than 3-4 minutes to have a crisp outer covering and remain succulent inside. Garnish the Chicken Schnitzel with lemon wedges and a sprig of parsley before serving. Serve hot along on the side of mashed potatoes and crunchy salad for a complete meal, or serve it as a filling for sandwiches, bread rolls or burgers for a quick snack. I run my own software company, SANIsoft as it’s CEO. After long hours at work, I find cooking incredibly therapeutic. After all, there is nothing more relaxing than cooking up a meal to soothe the body, mind and Soul. The idea for Swati’s Kitchen came about one day as I was chronicling one of my recipes for a dear friend. So here you will see my recipes and tips and tricks for making easy, rewarding and mouthwatering delights. Hi swati, can I try this chicken recipe with potato slices? Please let me know. Yes, I think you can. Do give it a try. I plan to try this dish in the Air Fryer. I will get back to you once I have done. Any suggestions for modifying the recipe for the Air fryer?